You can use this Mini amplifier to hear music from Mobile phone or Laptop. The speaker of Mobile phone and Laptop is too small and the output voice is sharp with high tone which is not pleasant to hear music for long time. This circuit will solve the problem. It can be connected to the earphone socket of Mobile phone or Laptop. It is too small and portable. 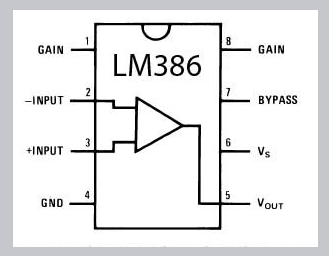 IC LM386 is used in the circuit which is a low voltage audio amplifier IC and its gain is internally set to 20.